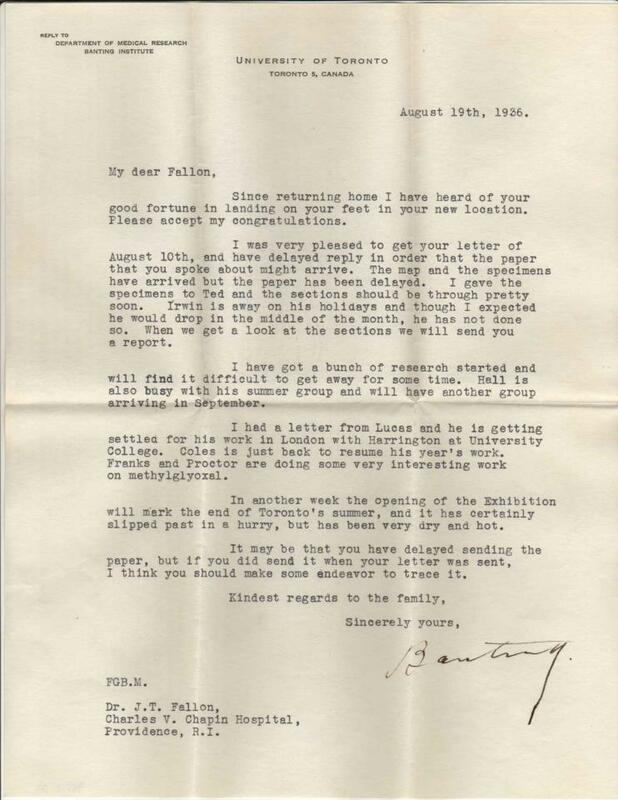 Letter from Dr. Banting to Dr. James T. Fallon. One of the many documents Banting House holds in its archives. Good morning! I hope everyone is keeping warm and dry on this very snowy Monday. I realized today that I have now been at Banting House National Historic Site of Canada for two months, going on three. The time is definitely flying by. Now that World Diabetes Day is over, we have been turning our attention to other projects. Today I wanted to talk a little bit about the exchanges of information that take place at Banting House (and many other museums, archives, libraries, and so on). This morning I finished researching the photo reproduction policies of other museums. We are working on setting up an official photo reproduction policy so that we can provide more effective public access to our growing archival collections. After all, we wouldn’t be a public history institution if we just stored these items: people need to be able to access them to appreciate them. We would love to see Banting House become not just a place to visit, but a place to conduct research. Our collections include correspondence, photographs, paintings, books, medical items, and more, and we get new donations every year. I have also been preparing for an interview I am conducting this Thursday with a man who recently donated a photo album to us. This conversation may help us learn a little more about the album, as well as about the circumstances of Sir Frederick Banting’s death (since he has connections to members of the Royal Canadian Air Force who remember Banting’s plane going down). My two morning tasks give you a brief snapshot of how we are committing to not only providing history education, but also learning from the public. This exchange of information is essential if we want to continue to be active in the community of London. As a public historian, this is exactly the sort of thing I love to see museums embracing. We are all able to help each other learn something new. This blog post was written by Stacey Devlin, graduate research assistant at Banting House NHSC. Stacey is a Master’s candidate in Public History at Western University. Posted in Behind the Scenes at Banting House.Tagged Banting, Collection, Documents, History, James Fallon, Letters, London, Museums, research. Previous Post Thank you for a great World Diabetes Day! Next Post Behind the Scenes: getting ready for Christmas!